Yesterday we looked at the function of the sidekick in a murder mystery. 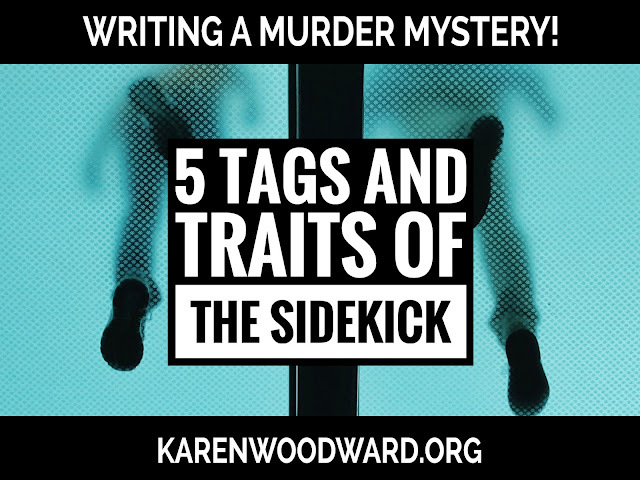 Today I want to look at the sidekicks tag’s and traits, characteristics that go to the core of who the sidekick is, that are especially revealing of their personality, their fictional soul. Sidekicks often have a foible or defect that has a comedic element. Sometimes they have zany theories, sometimes they have the opposite—a stanch refusal to accept certain kinds of explanations. Or they may have blindspots. Often a blind spot manifests as an obsession. For instance, Captain Hasting’s weakness for pretty auburn haired women. He would believe anything they told him, no matter how outlandish. The sidekick has all sorts of wacky theories about the crime. Generally the detective indulges him unless he’s in a hurry or the idea is exceptionally ridiculous. Often the sidekick is oblivious to this flaw in themselves but sensitive to it in others. For example, Constable George Crabtree on Murdoch Mysteries. George will think the culprits are little green aliens from Mars before a simpler and much more plausible explanation. It’s a bit like the Agent Scully trope in reverse. With Dana Scully from The X-Files, instead of refusing to accept the much simpler ‘alternative’ explanation, she stuck to her scientific guns even if that meant championing a bizarre explanation. b) Has a blind spot. The sidekick often has a quirk that prevents him from recognizing certain sorts of deception. For example, Hastings was easily charmed by pretty auburn haired women. Because of this blind spot he was fooled into bringing false information to Hercule Poirot. Poirot often chided Hastings’ for this particular weakness and his susceptibility to the charms of auburn haired women became a running gag. You can see how a character’s blindspot can be valuable to a writer. The detective must have a major setback and, since he’s the hero of the story, we often don’t want him to be the sole cause of the setback. The sidekick’s blindspot can be used to slip him false information. Possible blind spots: Age (even though I’m 40 I can pass for 20), fitness level (even though I haven’t worked out in a few months, I’m still in top physical condition), or weakness for a particular characteristic such a red hair or Lululemon workout clothes. a) The detective’s sidekick is usually not as intelligent as the detective. As we saw yesterday, having a sidekick who is intellectually average helps establish how brilliant the detective is. The sidekick is often teased by the detective for not being on his intellectual level, for not being able to see connections between clues, connections the detective feels are obvious. This adds another dimension to their relationship and helps the reader identify with your characters. b) The sidekick, by being more intellectually similar to the murderer than the detective, can give the detective a peek into the murderer’s mind. For example, Hastings was an enormous advantage to Poirot (or so the detective felt) because most murderers are (at least when compared to Poirot) of average intelligence. By listening to Hastings Poirot was able to understand how Hastings was being fooled. This was the effect. Having understood the effect it was easier for Poirot to work his way back to the cause: the murderer’s own thought processes. In a sense, Hastings was Poirot’s window into the murderer’s mind. The overwhelming majority of sidekicks have at least one classical virtue—bravery, loyalty, honesty, integrity, decency, and so on—that endears him to the detective and (more importantly!) to readers. For example, Arthur Hastings was brave and loyal and scrupulously honest. Poirot—while brave and loyal was far from scrupulously honest, at least when it came to solving a case! Hastings’ naively honest approach to life contrasts nicely with Poirot’s more utilitarian view of the appropriateness of telling the truth. Often the sidekick is a kind of Jiminy Cricket character, reminding your sleuth of what the average person would say or feel about what the detective is doing or how they’re doing it. That said, whether the detective has a strong conscience will depend on what the detective is like. Since the sidekick is the detective’s foil, whether they are The Conscience will depend on the detective. If the detective is highly ethical then the sidekick won’t be and vice versa. Sidekicks are often skeptical. Why? a) The sidekick reflects the reader's skepticism. Part of the sidekick’s role is to represent the reader, to reflect how they would react in any particular situation. Imagine meeting Sherlock Holmes in real life. How would you react if someone glanced at you and, from only the information gleaned from that one glance, told you all about yourself? Personally I wouldn’t believe it! My first thought would be: Where’d he hide the cameras?! After all, how could someone know EVERYTHING about me without observing my day-to-day activities? If that’s what you, the writer, thinks/feels in that sort of situation then that’s what the sidekick needs to think/feel. b) The writer needs a reason for the detective to explain their methods. Another reason sidekicks are skeptical is the writer needs a reason for the detective to explain something. This CAN seem artificial or very natural—it just depends how it’s done. Here’s a question I ask myself: Is the reader so curious that she WANTS TO KNOW how the detective works his magic? I think that’s the key. If the reader WANTS to know how the detective reached a certain conclusion then, sure, make the sidekick skeptical and nag the detective to explain his methods. That way, when the detective eventually does disclose how he reached a particular conclusion, it seems natural. My rule of thumb is this: Make the detective’s deduction as extreme, as miraculous, as possible without shattering the reader’s suspension of disbelief. How do you know if you’ve gone too far, made the detective’s abilities too exaggerated, made the explanation of his deductions too baroque? Easy! Show your story—or even just that scene—to beta readers. Further, make sure your beta readers love to read the kind of murder mystery you’ve written. Note: You could make your sidekick’s radical skepticism a blind spot in which case, no matter how outlandish the detective’s theory, readers might be more inclined to accept it. Imagine Mulder without Scully or Scully without Mulder. I loved the X-Files. The characters were addictive, but I think Mulder would seem like a complete lunatic without Scully and Scully would seem illogically intractable without Mulder. They balance each other. The more ‘out there’ your detective, the more fanciful his theories, the more grounded the sidekick needs to be. So far I’ve written about how the sidekick is a foil for the detective but there also needs to be characteristics the two share. After all, we don’t want the detective and sidekick to be COMPLETE opposites! Excellent memory. Often both the detective and sidekick have an excellent memory. In part, this is because it’s easier for the writer; you don’t have to get them to write down everything, they can simply remember it. Simple deductions. Often the detective’s sidekick notices more than the police. Over time, they may even begin making accurate deductions from what they saw. They won’t do this often, but it is one way to show the sidekick’s character development. Ability to hold their own in a fight. Often the sidekick is more physically engaged than the detective and so are often better able to protect themselves as well as the detective. That said, often the detective can hold their own against the bad guys and gals hoping to bash their head in. Today I’m sharing a link to the Lifelong Writing Habit: The Secret to Writing Every Day: Write Faster, Write Smarter, by Chris Fox. I believe that writing regularly is necessary for writing success! I know my writing improved after I began writing every single day. That’s it for today! Tomorrow I’ll wrap up talking about creating a sidekick for your detective and actual create one! As before, I’m not going into this with any pre-defined notions, I’ll just begin the creative process and see what I get! To be honest, this is my favorite part of writing. This is what I'm planning to do. The MC's conscience is crippled. He lost his partner (senior detective). His love-interest becomes his sidekick, but she never leaves her home. He tells her everything, and she helps him solve the murder(s) and also acts as his moral compass. She is not less intelligent than he, but he has police experience she does not and she has life experience he does not. Does this scenario work for you?